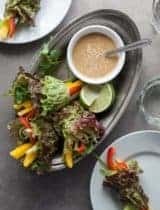 These portable bite-sized lettuce wraps are bursting with an assortment of crisp and crunchy spring vegetables and herbs. 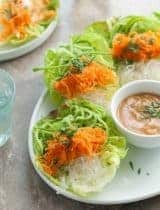 The first word that comes to mind when I think of these lettuce cups is fresh since they’re just about the freshest thing you can sink your teeth into and everything I love about springtime eating. 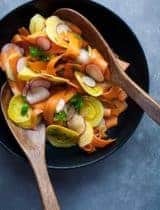 But the really lovely part is how simple they are to assemble, making it that much easier to pack any meal full of healthy raw vegetables while still being filling. The vegetable filled wraps are positively bursting with springtime goodness. 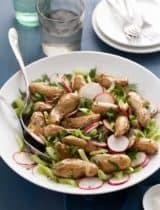 Inside is a pile of herb flecked crisp and crunchy snap peas and watermelon radishes sitting on top of cooling cucumber noodles and a bed of creamy almond spread, that’s all wrapped up in a tender butter lettuce leaf. 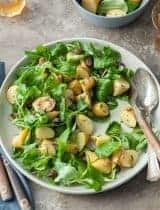 It’s crunchy and fresh and the perfect thing to bring on a picnic or barbeque or set out on a platter for brunch or lunch. Every bite is filled with an array of tastes, textures and colors. 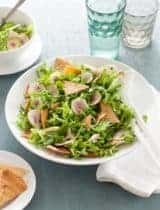 The creamy garlic almond spread (based on this recipe) comes together quickly in the food processor and has a taste and texture reminiscent of hummus (If you have a day to let it sit in the fridge do so, as the flavor will only improve.) 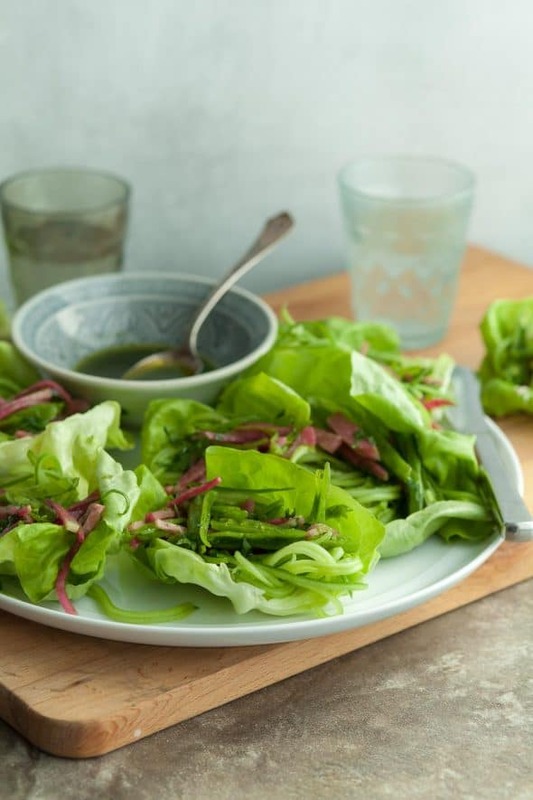 Its spread generously onto the lettuce leaves as the base for the vegetables. Next up are the cucumber noodles along with a snap pea and radish slaw. The slaw is dressed with a fresh herb oil made from a mix of springtime herbs like parsley, chives and mint. 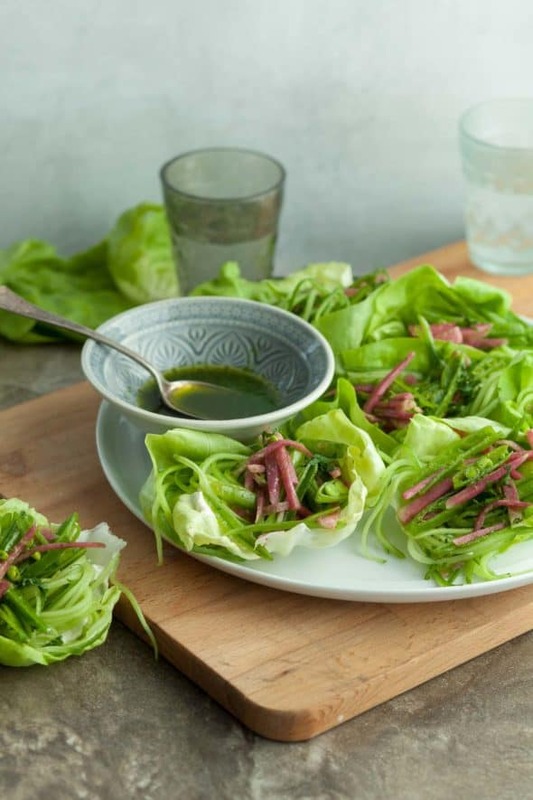 The almond spread gives the lettuce wraps a nice creamy foundation, while the vegetables add a cooling crunch and the herb oil a light and bright taste of spring. Wrapped up tight, it’s like a burst of springtime in every bite. 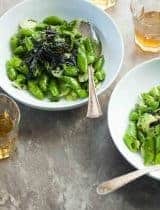 Bring a small saucepan of water to a boil. Add the almonds to the boiling water, turn off heat, cover and let sit for 15 minutes. Bring a pot of water to a boil and prepare an ice bath. Blanch the herbs in the boiling water for a few seconds. Quickly remove the herbs and place in the ice bath to cool. Remove blanched herbs from water and squeeze gently to remove excess water. Roughly chop and place in a small food processor. Add the olive oil and salt and process until smooth. 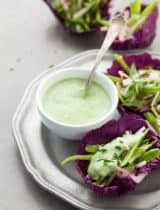 Spread a spoonful of almond spread onto the bottom of each lettuce cup. 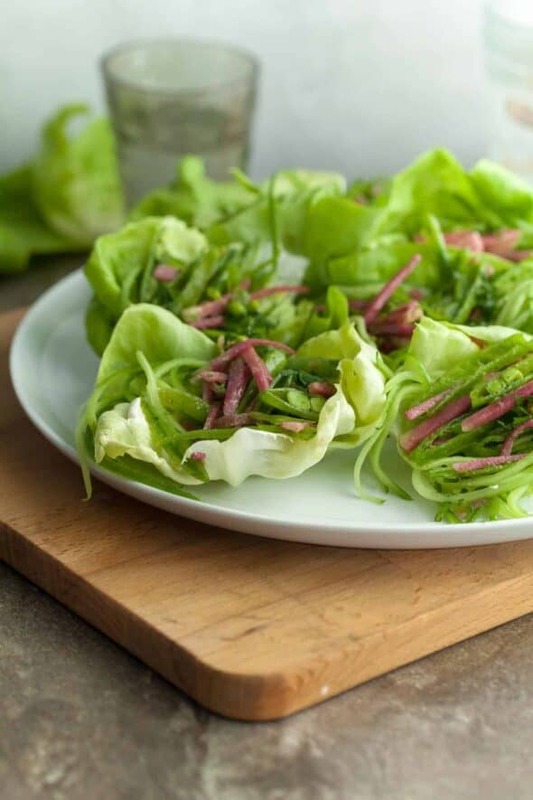 Divide cucumber noodles evenly between lettuce leaves, top with radish and snap pea slaw and serve.